The Edmonton Oilers will be making a change on defence when they play the Detroit Red Wings on Friday night. As has become the habit of the coaching staff lately, that change is not going to involve Brandon Davidson. Davidson has simply been too good to scratch. Davidson started the year on basically the same footing as Andrew Ference. Of Edmonton’s first eight games of the year, Davidson dressed for just one, having the misfortune to enter the lineup on October 13 against the Dallas Stars, a game in which the team from Texas took the Oilers out back to the woodshed and tanned their hide for 60 minutes. Ference, in contrast, played three times in that span. 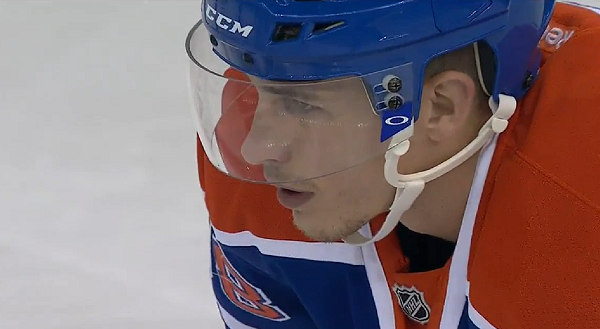 Davidson re-entered the lineup against the Kings on October 25, and would play in eight of the Oilers’ next 10 games. His ice-time varied widely, from a low of 13:31 against Chicago on November 8 (he’d be scratched the next night) to a high of just over 20 minutes on Halloween against the Flames. Still, he’d clearly shown the coaches something; no longer was there a clearly defined top-six with Davidson on the outside. He’s now played four consecutive games, and Detroit will be the fifth. He’s topped 20 minutes twice; on November 20 he played a career-high 23:40 against the Devils. All of Davidson, Griffin Reinhart and Eric Gryba have played eight of 10 games in November, and after tonight it will be Gryba and Davidson pushing their count to nine. The difference is that Gryba and Reinhart were both acquired by the new administration, that Gryba has nearly 200 games of NHL experience, that Reinhart is a former No. 4 pick who cost a fortune in the offseason. Both of those players started with jobs. Davidson was loose change left over by the last guys who ran the team, a low-end prospect vying with Andrew Ference for occasional game duty. This is what winning a job look likes. Davidson has come from a long way back, and he’s pulled even with two of the people that Peter Chiarelli brought in to fix things. It’s quite an achievement. Davidson’s been a pretty impressive player to watch, because he has what Lowetide likes to call a “range of skills.” He has good size (6’2”, 210 pounds) and plays a reasonably physical game. But he’s also competent with the puck, confident enough to rush it up ice if a spot opens up and skilled enough to make a first pass. He’s shown off a fairly heavy slap shot and—bizarrely, for a guy who never put up 15 points in the AHL—has convinced the coaches of his offensive ability to such a degree that he’s even seen power play usage. 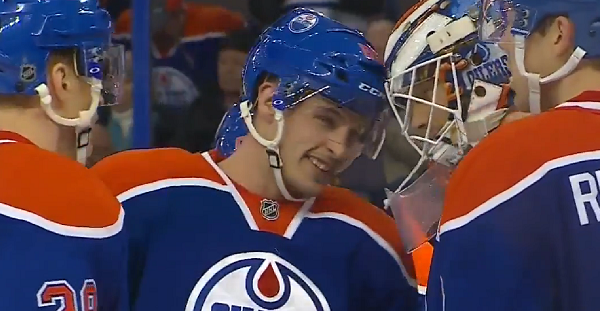 Edmonton does its best job of out-shooting the opposition when Davidson is on the ice. It does its best job of out-chancing the opposition when Davidson is on the ice. It allows very few chances against (Oscar Klefbom’s numbers are better, Mark Fayne and Andrej Sekera are just behind) when Davidson is on the ice. And to top it all off, Davidson is scoring. The caveat is that he’s doing it in third-pair minutes, for the most part; Davidson hasn’t been thrown into the fire against top competition or asked to log a gratuitous amount of defensive zone starts. But even within that context, his performance is impressive, head-and-shoulders above that of the more-touted Gryba and Reinhart. The guy he reminds me of is Kyle Brodziak. Brodziak was jack-of-all-trades, a player first passed over and then selected late at the NHL Draft, a guy who worked his way up the AHL depth chart and who was always overshadowed by people like Rob Schremp. Brodziak worked his way to an NHL career that so far counts 644 games, and in his prime was a strong defensive specialist who could also chip in 10-20 goals and 30-40 points. It’s early yet, but Davidson looks like a player who could be a valuable contributor during the heart of his career. UFA Profile: Brandon Davidson Round Three? If this team screws up Davidson, I’m done!! This is a good, young (drafted by the team) hockey player with a lot of upside in the future for this team on the blue line….HE’S A KEEPER, CHIA! I like Davidson – not only is he a solid player but he’s got that feel good blue collar story that embodies the people of Edmonton; too poor to afford higher division amateur hockey but worked his way up through the ranks; signed a value contract this year and has risen to the challenge; cancer survivor who didn’t let a medical illness derail his hopes and dreams. I hope we sign him long term. Plus, he’s from Taber Alberta! All that’s missing is a Corb Lund penned tune “The Ballad of Brandon Davidson”. But seriously, it’s a great story and every team needs guys that habitually work their assess off and never give up. Tough not to like this kid. I really think we have the makings of a good long term d core that should mature in the last half. Jonathan: I’m curious about the reference to Brodziak being overshadowed by people like Rob Schremp. Craig MacTavish didn’t have much faith in Schremp because of the gaping holes in his game. He much preferred Brodziak during the early years of his tenure in the organization. In their three common seasons with the Oilers, 2006-07, 2007-08 and 2008-09, Brodziak played 165 games in Edmonton while Schremp played just seven. Certain elements of the organizations really liked shiny toys. Like Schremp over Brodziak. Like courting Heatley over even talking to a great home young man developed in Kyle who we still could have. I think that is why players like Schremp did indeed overshadow others. Sorry Mr. Brownlee I am with Jonathan on this one. During their time as prospects, I think it’s fair to say that the presence of Schremp in the system was of substantially more importance to fan/media types than the presence of Brodziak. IIRC, back in 2007 when Schremp was sent down and Brodziak won a job and there was a lot of surprise about the outcome among the public. Maybe surprise among some fans, but Brodziak was never buried or pushed further down the food chain in the minds of those who made the decisions by the presence of Schremp. That held especially true for the head coach and his assistants. Brandon Davidson . i wish the rest of this team, not all but some, had what this guys has. Drive, refuse to lose. He has had hardship, and just battled through it all and is appreciative of the chance to play in the show. He is top 5 on this team, and hope he continues to progress. A long future at 4-5-6 reliable D man. PLUS A CANNON from the point. I am glad to be wrong about him. Earlier in the season I saw a liability. Not anymore. Hell, he’s out playing Reinhardt, Gryba..Go Oilers!! Go Sooners! Beat the crap out of OSU!!! Are we positively, 100% sure that Reinhart was Peters pick? The price that was paid I’m not so sure, more likely it was the curly haired kids pick. New defensemen are up and down and right now Davidson seems to be up. Hope he continues his strong play as it’s always nice to see one of the magic beans from years past actually sprout. Not to take away from the story though Davidson is a great late pick. But we do need to give Reinhart a chance. He will get better. It is always interesting to see how often hard work and dedication to learning out preforms talent and entitlement every time. Wow those offensive numbers are astounding, on a team that can barely manage a goal a game (ok sorry I had to get a little dig in). Seriously though, he’s been a nice surprise and he didn’t cost a arm or a leg! His story is a feel good story too. On a team that right now doesn’t make me feel very good. Listening to the Detroit TV feed. Mickey Redmond the former NHL player and the color man for Detroit say the Oilers aren’t vey good because they don’t have many players over 25. The Carolina guys said the same thing. Everyone knows the problem except the Oilers, too many young skilled players instead of mixture of young and veteran skilled players. The oil have me feeling extra negative this evening. Let’s just agree that you’re both wrong Brownlee and Willis. Savor that. Having the poise, vision, maneuverability and puck handling ability to effectively move the puck are not skills that appear overnight. Anyone who observed Davidson moving the puck and quarterbacking the powerplay on an overmatched Regina Pats will not be surprised that he is showing those same skills with the Oilers.